This tiny, perfect necklace. Made from tiny beads and little squares of felt in the colors of the country: cool, saturated pinks and yellows, warm aquas, and shiny black. And with it, a new understanding of why these colors always find their way into my work. Blouses. You can never have enough blouses. I have a few old ones from the seventies with my grandmothers name tags still in them. They itch but I can't bear to rip them out. 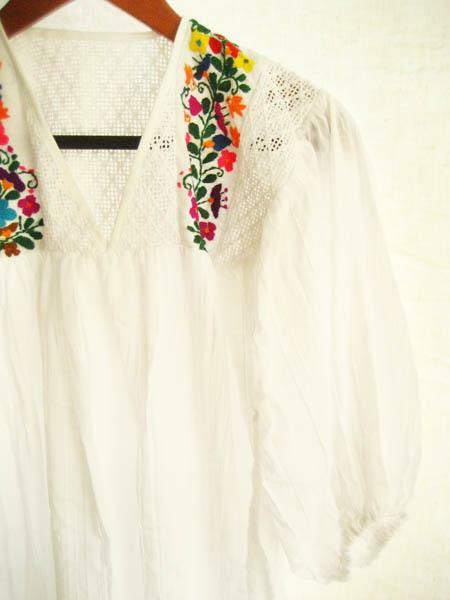 The one below is for sale at one of my favorite online sources for new and vintage clothing from Mexico, Aida Coronado. mexican blouse from aida coronadoa nostalgic yearning for the old kinds of mexican blankets before they were made of soft cotton. A little itchy maybe, until they have been beaten up a bit. vintage mexican blaket from Hacienda...and best of all: a husband who LOVES Mexico. The gorgeous doctor who appeared in a starched white fitted pantsuit to fix his stiff neck with a shot of something in the bum helped quite a lot, but there wasn't much that he didn't love. A new obsession with the country's pacific beaches, like this one near Zihuatanejo. This was our view for nine days.